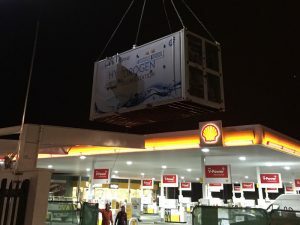 Energy storage and clean fuel company ITM Power is to construct a hydrogen refuelling station (HRS) at the Shell Filling Station, Beaconsfield, marking the first UK HRS to be integrated into an existing fuel forecourt. The Shell Filling Station is located at the Extra Motorway Services in Beaconsfield at Junction 2 of the M40 approximately four miles north west of the M25, and will feature the hydrogen dispenser under the main fuel forecourt canopy from early 2017. The station, which will be open to the public, will be deployed as part of the H2ME project and the OLEV HRS Infrastructure Grants Scheme and is co-funded by the FCH JU and the UK government. ITM Power has previously been granted planning permission to construct hydrogen refuelling stations at the Shell Filling Station at Gatwick, together with the Extra Motorway Service Area Shell Filling Stations off the M25 at Cobham and A14 (M11) Cambridge.